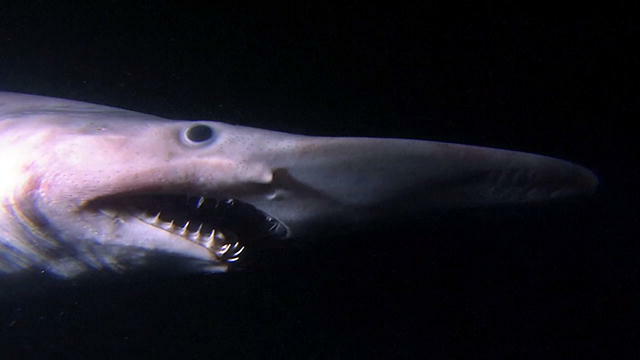 Goblin sharks are perhaps not the first species that comes to mind when you think about the creatures of the ocean. These unusual beasties are not as easy on the eye as some of the more glamorous animals that live beneath the waves. Nevertheless, they are a fascinating animal, and one that is rarely seen, so when one was caught of the coast of Australia, there was a bit of a buzz in the scientific community. The specimen in question was accidentally caught back in January by fishermen working in Green Cape, off the New South Wales coast, at a depth of around 200 meters, AFP reports. It was then taken to the Merimbula Aquarium before being donated to the Australian Museum in Sydney. The Australian Museum’s fish collection manager, Mark McGrouther, spoke about the newly acquired specimen. “It’s pretty impressive, it’s not hideous it’s beautiful,” said the museum’s fish collection manager Mark McGrouther. “They are not caught terribly often. They are not encountered terribly often at all.” It turns out that only four goblin sharks have ever been obtained by the museum, and McGrouthe has only seen three throughout his whole career. Perhaps the most astonishing characteristic of the Goblin Shark is its incredible jaws. These are able to seemingly launch from the sharks head in order to capture prey. Scientists think they live a fairly sedentary life style, cruising the depths of the oceans trying to locate prey via their ampullae of Lorenzini, a set of pores that line their snout that are able to detect electrical signals in the water. The depths at which they live is one of the reasons encounters with them are rare, and so the acquisition of this specimen was very exciting and could lead to other secrets about the animals lifestyle being revealed.